By utilizing a unique multi-core design and patented Reassembly-Free Deep Packet Inspection™ (RFDPI) technology*, the SonicWALL® Network Security >Appliance (NSA) Series of Next-Generation Firewalls offers complete protection without compromising network performance. The low latency NSA Series overcomes the limitations of existing security solutions by scanning the entirety of each packet for current internal and external threats in real-time. The NSA Series offers intrusion prevention, malware protection, and application intelligence, control and visualization, while delivering breakthrough performance. With advanced routing, stateful high-availability and high-speed IPSec and SSL VPN technology, the NSA Series adds security, reliability, functionality and productivity to branch offices, central sites and distributed mid-enterprise networks, while minimizing cost and complexity. Comprised of the SonicWALL NSA 220, NSA 220 Wireless-N, NSA 250M, NSA 250M Wireless-N, NSA 2600, NSA 3600, NSA 4600, NSA 5600 and NSA 6600, the NSA Series offers a scalable range of solutions designed to meet the network security needs of any organization. Next-Generation Firewall features integrate intrusion prevention, gateway anti-virus, anti-spyware and URL filtering with application intelligence and control, and SSL decryption to block threats from entering the network and provide granular application control without compromising performance. Scalable multi-core hardware and Reassembly-Free Deep Packet Inspection scans and eliminates threats of unlimited file sizes, with near-zero latency across thousands of connections at wire speed. Application intelligence, control and visualization provides granular control and real-time visualization of applications to guarantee bandwidth prioritization and ensure maximum network security and productivity. Stateful high availability and load balancing features maximize total network bandwidth and maintain seamless network uptime, delivering uninterrupted access to mission-critical resources, and ensuring that VPN tunnels and other network traffic will not be interrupted in the event of a failover. High performance and lowered TCO are achieved by using the processing power of multiple cores in unison to dramatically increase throughput and provide simultaneous inspection capabilities, while lowering power consumption. Advanced routing services and networking features incorporate 802.1q VLANs, multi-WAN failover, zone and object-based management, load balancing, advanced NAT modes, and more, providing granular configuration flexibility and comprehensive protection at the administrator's discretion. Standards-based Voice over IP (VoIP) capabilities provide the highest levels of security for every element of the VoIP infrastructure, from communications equipment to VoIP-ready devices such as SIP Proxies, H.323 Gatekeepers and Call Servers. SonicWALL Clean Wireless optionally integrated into dual-band wireless models or via SonicWALL SonicPoint wireless access points provides powerful and secure 802.11a/b/g/n 3x3 MIMO wireless, and enables scanning for rogue wireless access points in compliance with PCI DSS. Onboard Quality of Service (QoS) features use industry standard 802.1p and Differentiated Services Code Points (DSCP) Class of Service (CoS) designators to provide powerful and flexible bandwidth management that is vital for VoIP, multimedia content and business-critical applications. Integrated modules support on NSA 250M and NSA 250M Wireless-N appliances reduce acquisition and maintenance costs through equipment consolidation, and add deployment flexibility. With SonicWALL® 4-port GbE and 2-port SFP M1 Modules for the SonicWALL NSA 250M, you can add more network interfaces to an existing deployment, consolidate hardware and even increase functionality with a fiber connectivity option. Expanded port density - The SonicWALL 4-Port GbE M1 Module expands port density by adding four 1-Gbps Ethernet networking interfaces without incurring costs of an additional switch, reducing points of failure. Comprehensive security - The 4-port GbE M1 Module integrates SonicWALL Reassembly-Free Deep Packet Inspection™ (RFDPI) to added port interfaces, delivering comprehensive security that a separate, expensive Layer-3 managed switch does not provide. Highest speeds - The 4-port GbE M1 Module negotiates 10/100/1000 Mbps (1 Gbps) Ethernet speeds. It automatically negotiates the best speed available through MDIX. It can also be manually configured to a particular speed. Comprehensive central management - Administrators can manage the modules using the SonicWALL Global Management System™. Fiber connectivity - The 2-port SFP M1 Module offers a fiber alternative to the 4-Port GbE M1 Module, enabling more flexible and scalable deployments in a wide range of environments. Flexible deployments - The 2-port SFP M1 Module can use any SonicWALL-supported third-party SFP transceivers, whether using multi- or single-mode fiber, or regular copper GbE connectors. Comprehensive security - The 2-port SFP M1 Module integrates SonicWALL RFDPI to added port interfaces, increasing your network security. Comprehensive central management - Administrators can manage the module using the SonicWALL Global Management System. Every SonicWALL Network Security Appliance solution delivers Next-Generation Firewall protection, utilizing a breakthrough multi-core hardware design and Reassembly- Free Deep Packet Inspection for internal and external network protection without compromising network performance. 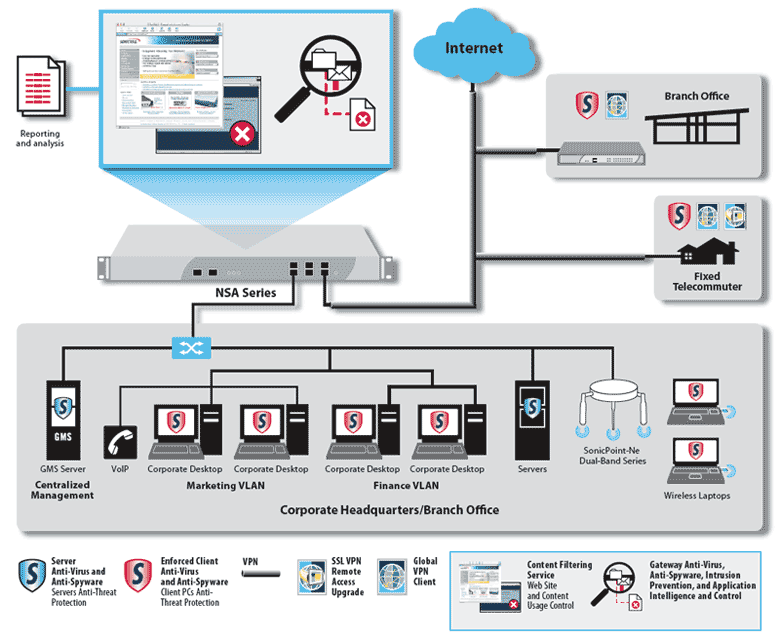 Each NSA Series product combines high-speed intrusion prevention, file and content inspection, and powerful application intelligence and control with an extensive array of advanced networking and flexible configuration features. The NSA Series offers an accessible, affordable platform that is easy to deploy and manage in a wide variety of corporate, branch office and distributed network environments.